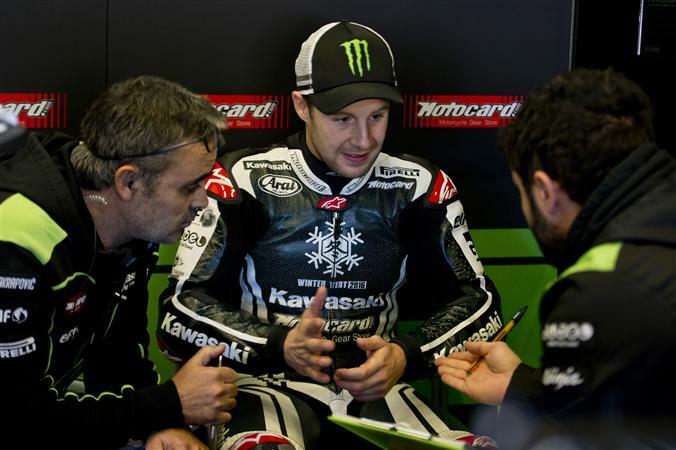 Kawasaki’s Jonathan Rea talks with his crew during testing at Jerez. You can expect more coverage of WSB here on MD next year. Former MotoGP champ Nicky Hayden’s move to the series caught our interest, but frankly the racing is always top notch and exciting in the production-based series. The bikes are very fast, too. Nicky Hayden got his first taste of his new Ten Kate Honda CBR1000RR, and he is already pretty quick. A sentiment expressed by Hayden, and others, following the Jerez tests might be boiled down to something like this: “The problem is the Kawasakis are too fast”. Kawasaki starts out with two great riders, of course, including 2013 WSB champ Tom Sykes and current champ Jonathan Rea (see the video featuring Rea below). The problem for the competition is the Kawasaki beneath these two men has frequently been too much to handle in the last few years, and both riders are already very, very quick on the all-new 2016 racer based on the production ZX-10R. How quick? Wrap your minds around this. During the Jerez test, both Kawasakis were easily into the 1:39s, with Sykes posting a time that would have placed him ninth on the MotoGP grid earlier this year. That’s right, during shake-down tests of the 2016 model, Sykes posted a lap time quicker than the best qualifying effort at Jerez by Yamaha Tech3 rider Bradley Smith! On a superbike! After four post-season winter tests the entire Kawasaki Racing Team have learned much about their all-new 2016 Kawasaki Ninja ZX-10R machines, particularly the riders Tom Sykes and Jonathan Rea. They left a four-day test session at Jerez in Spain as the top two riders on the time sheets, in addition to demonstrating the strongest pace on race tyres. With four days on track this past week at the 4.423km long Jerez circuit, including a rest day on Wednesday, both Sykes and Rea exploited their ‘Winter Test Four’ opportunities to the maximum on the new Ninja, despite Rea missing out on some track time today after a fall that damaged his bike in the early afternoon. Using a qualifying rear tyre to get a feel for the new Kawasaki on the same rubber the riders will use for Superpole qualifying in 2016, Sykes set a best lap of the tests today with a 1’39.313. This was well under his own best lap set at the 2015 Jerez race, of 1’40.292. Rea was also running at a very high tempo when he tried a qualifying tyre, setting a 1’39.524 lap, in addition to a 1’40.1 best on race tyres. His race pace, like that of Sykes, was class leading in a test attended my most of their top rivals at some stage. Sykes and Rea had pushed their machines to the limit at this test in late November, given the dry and relatively warm track conditions on each and every day. Each bounced back from falls at certain times as they tried new and sometimes experimental settings at their maximum potential. Each completed the tests in good physical condition and with positive feelings about their new machine and its possibilities for the 2016 season. Winter Test Four is the last of the 2015 calendar year but the team will return to Spain for more track time on the all-new Ninja ZX-10R in January, after the end of the test ban period. After those sessions they should be at full readiness for the first round of the new season in Australia on February 28th, which will be preceded by the usual official organisers’ test at the host circuit of Phillip Island. Jonathan Rea testing his 2016 Kawasaki superbike at Jerez. Looking forward to this season, and a time when Kawasaki is competitive in GP. The motoGP bikes run the softest tire they can in qualifying, usually only good for a lap or 2, how is that not a “qualifying ” tire. Personally I think they need to stop this charade and combine the 2. Also think that if you race motoGP, you should be required to race moto2 with 2 of the GP bike’s cylinders and moto3 with one of them. Racer could be based on street legal bike and electronics, dual clutch transmissions allowed, race on Sunday, sell on Monday. MotoGP qualifies on a soft tire, but it’s the same as the soft option on offer for race distance, not a special tire just for qualifying. Makes it all the more remarkable that Rossi would have such modest qualifying times and be right on pace in the race, yeah? I thought I read somewhere that the long term plan is to do as you suggest so that all 3 platforms use the same cylinder & valve configuration. My understanding is that the reason the MotoGP bikes only make a couple of laps in qualifying on what is supposed to be a soft RACE tire is that the settings and riding style are turned way up, outside of a fashion that would result in the tire lasting the race. Indeed, many teams race on the same tires that are used in Q.
Oh, and I agree with your idea about sharing cylinder tech across the classes. Sounds like it would save development costs and also make it more clear to the viewer what was happening between the classes. Dorna won’t allow the Superbike times to run that close to Moto GP bikes. There’s a back room somewhere where ideas are being tossed about on how to dumb down the WSB series. You’re right and they really shouldn’t run the qualifying tires. Qualies are worth up to a second a lap or more but you don’t race on them and it just makes set up more difficult to switch back and forth wasting time on getting a good qualifying run with them. MotoGP bikes will stay faster by a couple of seconds once they come to grips with next season’s tires and electronics. Looks like a long WSBK season for any team not named KRT. It’s amazing that Honda let Rea split. It’s usually the other way ’round, Honda stealing the best from other teams. Do you guys think Rea is in a position to demand that 50% cut in pay he took to join the team? I’m surprised KRT allowed Rea to disclose that, or maybe it proves how desirable was the bike and Rea knew he’d never reach #1 riding for Honda. Do those guys performing support tasks on the KRT look serious as heart attack, or what? If I owned a pro sports team (vehicle racing, any kind of ball team, you name it), I’d offer money just to have an observer tag along for one year, and find out how that team functions. It almost makes you want to buy a Kawasaki just to honor the team for their excellence (but I still much more prefer the Yamaha cosmetics). Rae spent years riding the Fireblade, often to positions it had no business achieving. He also gave them a Suzuka win and performed admirably on the RCV during his wildcard/substitute ride. Honda owed him a new bike more than he owed them another season, money be damned. He’d already have another championship under his belt if he’d left for Kawasaki or Aprillia a season earlier, I wager. Bikes always lap faster in black. Great to know focusing R&D effort in WSB is also a valid path. I’d expected the Yamaha with MotoGP tech to cream the field but, Kawasaki bettered them. That should be a message to other MFGs. Now Honda should get their act together. It’s about time for the vaporware CBR replacement to materialize. And get it right as a big thank you gesture for what Nicky’s done for them. It took them several years. Sykes had a year or two when he’d TQ but couldn’t get the tires to make race distance. Still, to be so fast on a new platform? That’s got to be discouraging for the rest of the teamds., to know they’ll likely get even more out of it. Just commenting on Kawasaki’s path to where they are. It’ll be a hard act to follow for other teams. If Honda delivers another bike it’ll be to attempt to sell more sportbikes and they haven’t seemed that interested, at least not as much as the others, in doing that. When Rea was on it, WSBK did allow them to add things/features that were outside of the existing rules (ride-by-wire throttle) to help the bike be more competitive. I had hoped that this was the reason behind them making the limited run of RC213’s, but now I wonder if they’re worried about what it’ll do to their reputation if they can’t beat street bikes with it, assuming it’s legal to run.. Wait, interesting, have you heard any reports of planning on racing the RC213V-S in SBK? Honda had trouble meeting homologation requirements with the CBR1000RR SP. There isn’t a chance in hell of meeting requirements with the RC213V-S, even with the reduced sales requirements now in place. Morpheus: Stop TRYING to beat me, and beat me. It’s worth noting that Nicky Hayden did a 1:40.19 at that same test, in only his second ride on that bike! Yes. It would be nice to know how fast Nicky was at Jerez on his old MotoGP bike. It couldn’t have been much faster. All at Jerez in May 2015. Which makes the Ten Kate SBK machine look pretty good, the customer Honda MotoGP bike fairly sad, or both. As close as Nicky is to the wsbk Kawi’s, they ran times that would’ve put the kawi in 9th at the motogp, Nicky’s time would’ve put him down around 23rd. MotoGP is a TIGHT field in qualifying. More than a tall order: not a chance if Rea and Sykes are turning 1:39s at Jerez during “shake-down” testing of the new bike. It is a testament both to how good the riders are and how good the Kawasaki is. I think Hayden’s chances of consistent top five finishes are largely dependent on how solid the new Yamaha’s are. If Yamaha comes out strong, Hayden won’t see the top five very often at all without a new bike and serious effort from Honda. However, Ronald Ten Kate has been making some really strange (and, frankly, difficult to interpret) statements in interviews about when a new thing will be available. So we will see. I’m trying to remain optimistic but already hold Honda responsible for (among other things) not giving Rea a solid machine while they had him. Have learned not to hold my breath. I haven’t seen the interviews. Is he implying they may receive the new bike early? I hope? It’s hard to say. I think we all think it’s not before 2017, though apparently there is some engine work coming good around the start of the year. You really have to hear his comments, they’re terribly obscure but he references things like the timetable in the mind of the interviewer versus his own personal timetable, not specifically giving a date which either timetable represents. What Ronald does say, with clarity, is that he expects to go from wherever they are right now, straight to the front. FWIW. Oh, and should you want to hear him for yourself, which I recommend, videos can be found at the world SBK site. Since Yamaha’s been out of WSBK for a while and I’ve not seen anything regarding Superbike in the US. Is Yamaha running the R1 or the R1M? R1M have too many bells and whistles? Considering the changes teams are allowed to make to the production bikes, I believe the differences between the R1 and R1M become irrelevant. I wish we could get more articles that compare lap times between MotoGP and WSBK. I was blown away! Does anyone have technical reasons for why superbikes are that close to GP ones? I mean, 9th? I know superbikes are fast, but they’re still very limited compared to a full on GP machine. You’d think the KRT guys would be able to climb several further spots up from 9, if they were allowed to disregard all similarity with a street machine that has to sell for something half sane. Are there specific rules in MGP (fuel, tires…?) that superbikes don’t have to abide by, that may slow the GP bikes down disproportionately? Man, “street”bikes go this fast now. Just imagine how fast they’d go with the kind of money that would be at stake, if the main motorcycling buying demographic hadn’t aged out of racy riding positions….. Or, how fast they’ll go once the massive youth cohorts in less developed countries become a realistic target market for liter bikes. The times were done on qualifying tires. Race tires are about another second off. BTW, I can remember when Kawasaki finished just 10th in a US Grand Prix race on a prototype. (Can you? 😉 That the current detuned SBK machines are in the ballpark is impressive. The differences between MotoGP and WSBK are slowly disappearing. Differences in any technology always move towards the middle as the information about producing the advanced versions becomes readily available. Plus, the laws of physics limit the maximum speed at which you can go around any given track. MotoGP bikes reach that limit sooner than WSBK bikes, but the WSBK bikes are almost there. In order to keep MotoGP faster than WSBK, Dorna will have to cripple WSBK, which will make a lot of us damn angry. Already done. See this article from 2014. More to come? Who knows. They already have to paint on lights. I hope Nicky can hang on long enough to get some all new Honda kit to ride so that he can properly show his talent. That said I’m a Yamaha guy and I’d like to see them hand it to Kawasaki like they did in BSB this season. Having Guintoli and Lowes on the team should put them in the running. Have you heard the new Yamaha SBK machine yet? It sounds just so gnarly! That cross-plane crank does produce a wicked howl when the engine really winds up. And listen to that snarl on trailing throttle. Thats what will make the new R1 upright so much fun to ride. Just listening to the motor. Wish I were younger and taller. One of those babies would be going into my garage the day they became available. Really looking forward to the 2016 SBK season. Will Rea repeat? How will Sykes respond? The fact that the duel at the front is often intra-team takes nothing away from it for me. Never been a Kawasaki fan per se, but watching these riders exploit their machinery has been exciting. No secret that I can’t wait to see what NIcky will do. From very early days, it’s evident that he’ll be in the mix. But can he beat Rea and Co. on the bike that Rea could not succeed upon? A tall order, particularly with Rea’s quote at the end of the video that he knew 5 turns in on the green bike that he was going to be able to step up considerably. Two things are certain: Nicky will put in the effort, and Ten Kate are scrappy and resourceful. My hope is for consistent top 5s in 2016 and racing for wins in 2017 on a new – long-awaited is too generous a term I think – Honda superbike. To have retired from MotoGP with a functional wrist is a great blessing. Go 69!